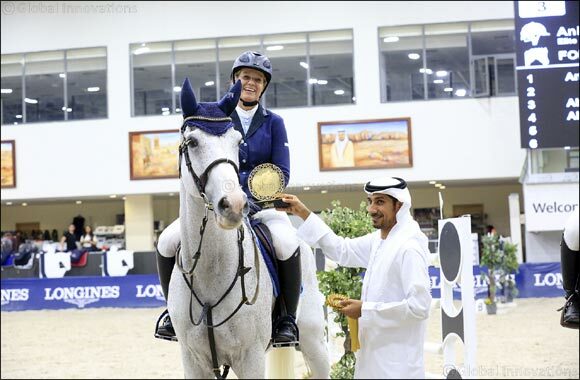 Dubai, UAE, April 15, 2019: Anita Annika Sande and her horse ‘For Cash 2’ from Elite Stable was the victor in the closing competition of the 15th week of the Emirates Longines Show Jumping League that was held on Thursday and Friday at the Sharjah Equestrian & Racing Club. Riders of all categories participated in the competitions as they strove to acquire more points in order to improve their overall ranking. This National was the final competition where riders had the opportunity to accumulate points before the Longines Final marks the end of the season in two weeks’ time. Sultan Al Yahyai, General Director of the Sharjah Equestrian & Racing Club and Hussam Zummit, Representative of the UAE Equestrian and Racing Federation (UAEERF) presented the prizes to the riders. Norway’s Anita Annika Sande and her 13 year-old horse ‘For Cash 2’ from the Elite Stable won the One Round Jump Off for Division 1 with jumps placed at 140 cm. 23 riders participated, of which eight managed to complete the main round without any faults. Three of these riders succeeded in completing the jump off round without faults with Anita Annika Sande jumping to first place with a time of (39.46) seconds. Denmark’s Tina Lund and her horse ‘Carallo’ from Dubai Polo & Equestrian Club came in second finishing the Jump-Off in (39.95) seconds, while third place went to the UAE’s Abdul Rahman Al Hebsi riding on ‘Charly Braun’ from Abu Dhabi Equestrian Club who completed the jump off in (42.18) seconds. Saudi rider Abdullah Al Sharbatly and ‘Chap 47’ from the Sharjah Equestrian & Racing Club won first place in Thursday’s One Round Against the Clock class where the course was designed with obstacles at 135cm height. 32 riders participated in the event, of which 11 riders succeeded in completing the round without any faults. Friday’s One Round with Jump Off class saw the participation of 24 riders who flew over jumps placed at a height of 135 cm. Seven riders tied in the Jump Off, of which five completed without any faults. Tina Lund took the lead riding on ‘Payse Heutiere’ finishing the round in (34.53) seconds, with Mandara Equestrian Club's Moh'd Fadi Al Zabibi from Syria and ‘Ulac De Montsec’ coming in second. Third place was taken by Jordan’s Sara Hussein Saleh Al Armouti and ‘Gladiator-P’ who finished the round in (35.70) seconds. In Thursday’s class of One Round Against the Clock for Division 1 riders with jumps set at a height of 125 cm, 24 riders participated with 14 of them succeeding in completing the round without any faults. Sharjah Equestrian & Racing Club’s Ali Abdalla Al Khadim and ‘Doxanne B’ came in first place. In Friday’s Two Phases competition for Division 1 riders with jumps set at a height of 120 cm, the UAE’s Salim Ahmed Al Suwaidi and his 9-year-old horse ‘Snapp Jack’ from Sharjah Equestrian & Racing Club came in first while his fellow club member Egypt’s Mohammed Ashraf Abdalla Ashraf on ‘Carlotta’ secured third place. Second place went to Mhd Osama Al Zabibi and ‘Toulana’ from Mandara Equestrian Club. In the first competition of One Round Against the Clock on Thursday, riders from three categories participated - for Division 2 and Junior riders, the jumps were set at a height of 125 cm, while for riders competing under the Young Horses (5-6 years old) category, jumps were set at 120 cm. Amongst the Division 2 riders, 16 participated but first place was secured by Syria’s Youssef Sawas riding ‘Elton’ from Al Ali Stables. From the 22 Juniors that competed, the American rider Ayman Nasser from the Sharjah Equestrian & Racing Club came in first with his13-year-old horse ‘Brandy’. 27 riders with young horses also participated in the round and the first place went to Tina Lund and ‘Celvita Z’. On Friday’s Two Phases competition for the three categories’, 10 Division 2 riders participated but it was Sharjah Equestrian & Racing Club's Imad Gharib from Syria and ‘Quattro 3’ who won first place. 16 riders participated in the Juniors’ category with Mhd Osama Al Zabibi and ‘Paprica’ securing another win. This class also saw the participation of 25 riders in the young horses category. Sheikh Rashid bin Ahmed Al Maktoum and his horse ‘Invictus DXB’ from Emirates Equestrian Centre came in in first. For Novices, Children and Young Horses’ (4-5 years old), Thursday’s class of One Round not Against the Clock had obstacles set at a height of 110 cm where riders needed to ride a clear round in order to win. 14 out of the 39 participating Novice riders succeeded in completing the round without faults while four out of the six riders with young horses also placed and seven out of the 11 children. During Friday’s round of One Round not Against the Clock, 41 Novice riders participated of which 17 succeeded in placing. Additionally, three out of the five riders who participated with their young horses (4-5 years) completed the round without any faults. Amongst the children, seven out of the 11 competitors placed as well. The 15th week of the Emirates Longines Show Jumping League opened with a competition for Novice Division riders with a One Round not Against Clock class in which jumps were set a height of 80 - 90 cm. 35 riders competed in the round and 17 of them succeeded, while in the second phase on Friday with jumps placed at the same height, 37 riders participated but only 16 were successful in completing the round without any faults.